… once Special Votes are counted and announced on 7 October. Three years ago, there were 330,985 Special Votes cast, accounting for 13.5% of total votes. That reduced National’s seats in Parliament by one, and gifted the Green Party a fourteenth MP. The balance of power in Parliament went through a seismic shift with that one transfer of a single seat. This year the number of Special Votes has risen dramatically to (approximately) 384,072 (or 15% of total votes). Special Votes have traditionally supported left-leaning Parties and Labour and the Greens may pick up one or two extra seats, at the expense of National. This may result in former Iranian refugee, lawyer, and feminist activist, Golriz Ghahraman becoming the Green’s eighth MP. Two extra MPs will send Mojo Mathers back to Parliament. National will lose one, maybe two seats, reducing it’s MPs from currently 58 to 57 or 56. No wonder Peters, Labour, and the Greens can afford to bide their time. Two weeks will give the three parties a clearer picture as to what voters have delivered. She continued asserting that the Maori Party could work in coalition with Labour. In effect Ms Fox was re-branding the Maori Party as an opposition party working to change the government. Ms Fox may have been earnest in her desire to move her party to the left. But Flavell’s comments suggest otherwise. The demise of the Maori Party should not surprise anyone. They have suffered the doom of any small political party that has made two grievous mistakes. Mistake #1: Moving too close to their major coalition partner and being over-shadowed and subsumed by the Blue Colossus that was the National-ACT Government. In blaming voters for their defeat, Marama Fox and Te Ururoa Flavell and other Maori Party leadership ignored the gradual decline of voter support until they had nothing left. “The downside of being in government with National is having to put up with all the anti-worker, anti-beneficiary and anti-environment (and therefore anti-Maori) legislation that comes as a natural consequence of having a right-wing government. The Maori Party is a coalition partner of that government and our co-leaders are ministers in that government, so unless we take a very strong position against some of the government’s legislative agenda we will be seen as supporting that agenda. ” It needs the nuclear option. It needs to kick National in the guts and walk away. It’s time for Flavell to change the narrative. He needs to start distancing the Maori Party from National. He needs to start extricating it from the cosy relationship. Which is unfortunate, as I believe that the Maori Party’s voice in Parliament added to the public discourse. One hopes that a resurgent Maori-Mana Party will return in 2020. Maori need representation in the House, independent of any mainstream, pakeha-dominated party. Gareth Morgan – green with envy? Gareth Morgan’s call for the Green Party to work with National is either political naivete – or a cunning plan to undermine and eventually destroy the Green Party and siphon off their voter-base. Either way, not a look look for Mr “Common Sense”. The fate of the Maori Party (and other small parties whose orbits took them too close to their stellar coalition partners) is a clear warning that a blind person could see. Mr Morgan should to stick to his “knitting” such as promoting the Universal Basic Income and building his own party for 2020. With no hope of ACT’s sole MP, David Seymour, pulling in a second MP on his “coat-tails”, National might as well cut him loose and regain Epsom for themselves. Who can really care anymore for a “Party” polling at half of one percent? He said it was pretty clear cut that a two-party coalition would be more stable, and voters had given National a task of forming a government with New Zealand First. “Our position in going into those negotiations is that almost one in two New Zealanders supported National. ACT would complicate a governing arrangement, and he would not expect the party to be included in that government. Typical of right-wingers; demanding personal responsibility from the rest of us – but never showing any themselves. If ACT cannot win electoral support under MMP, then it will never achieve success under any system (except maybe at gunpoint). Perhaps Mr Seymour should just accept that 99.95% of voters simply do not like ACT’s free-market, dog-eat-dog, and corporate-welfarism for it’s taxpayer-funded Charter Schools. When Gareth Morgan’s TOP gained four times more votes (48,018 – 2.2%) than ACT (10,959 – 0.05%), what does that say about the fate of neo-liberalism in this country? The question is, what will he do about it? Does Winston Peters really want his party to end up like the Maori Party, ACT, and Peter Dunne – all casualties of their political closeness to National? As others have pointed out, a vote for NZ First was indeed a vote for change. Otherwise, those leaning toward National would have cut out the Black & White Middle Man and voted for the Blue Team. Going with National is More of the Same. 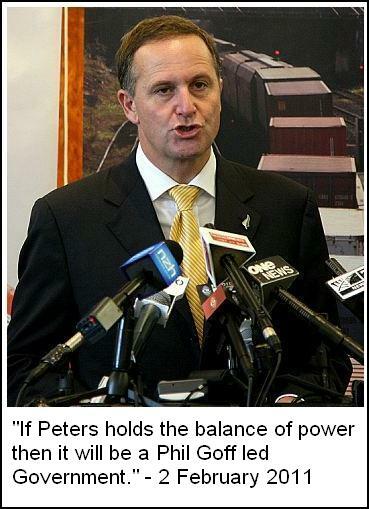 Choose wisely, Mr Peters, choose wisely. With the demise of the Maori Party and the assimilation of all seven Maori Seats into a mainstream, predominantly white-person’s political party, it is more apparent than ever that we need to retain those Maori Seats to ensure on-going, guaranteed Parliamentary representation for Tangata Whenua. If National bows to Peters’ demand for a referendum on the seats, it will be a sad day for democracy in this country when the Majority get to choose on entrenched safeguards for a Minority. Why do (some) pakeha feel so threatened by seven seats when they have 113 seats for themselves, under their potential full control? It can’t be any notion of “reverse-racism”. Those who demand the abolition of Maori seats rarely concern themselves with such matters. In a Hollywood movie, a budding politician rises up from nowhere and successfully takes on the political Establishment Elites. After a struggle, the hero/heroine prevails, showing that truth, courage, and integrity will always defeat the Dark Forces of the political Elite. Cue happy ending; cue stirring theme music; roll credits; bank the ticket-takings. In real life, Steven Joyce and his party strategists (with the assistance of Crosby Textor?) spun two lies, regarding Labour’s mythical “$11.7 billion fiscal hole” and that Labour would “raise taxes”. None of which were remotely true. Joyce was aided and abetted by Bill English who unashamedly repeated those two lies at every opportunity, whether on-air debates or interviews on Radio NZ, Q+A, The Nation, etc. At no point did either man resile from their wilful calumny. If 998,813 voters who ticked “National” on their Party Vote ballot weren’t aware that the two claims were barefaced lies – or, knew it was a lie and simply didn’t care – Joyce’s strategy for mis-information worked. The Dirty Tricks strategy was previously used against Winston Peters when an unknown agent leaked his superannuation over-payment to the media. At the next election, Labour and the Greens must be better placed to strategically address “fake news” from the National Party. Labour and Green strategists must be conscious that the Nats will stoop to lies if their pre-election polling shows them at-risk of losing. A rapid-response task-force should be ready and well-resourced to counteract such lies; to do it immediately, and with energy. “…And one of the issues was the attack from National on tax and their lies, in effect. Now, why didn’t you call them out earlier? […] But do you look back now and go, ‘We were relentlessly positive, but we let their relentless negativity come in too much.’ Do you look back now as you wake up and go, ‘Oh, we should have called them out earlier.’? This style of dirty tricks cannot be allowed to become New Zealand’s “new norm”. The Nats are nothing if not “flexible”. As are their “principles”. The Standard: Where to now for the Greens? This blogpost was first published on The Daily Blog on 25 September 2014. The final day of campaign is upon us. Tomorrow is the “official” Election Day and nine years of National government is about to either end – or win a rare fourth term. Polling does not look good for an outright win for the Labour-Green bloc. English seems to be “relaxed” about borrowing from our former Prime Minister’s handbook to bend the truth – or just outright lie when it suits his selfish needs. National’s willful lying on this issue is classic Crosby-Textor manipulation; throw mud and some of it will stick in the minds of poorly informed voters. Or voters who know it’s a lie – but want to feel validated voting for a party that promotes the lifestyle of the Cosy, Comfy Middle-class. This has been borne out with comments I’ve heard during my door-knocking and market-stalls campaigning for the Green Party. A few from the Cosy, Comfy Middle-class seemed eager to voice derogatory opinions about Metiria Turei, but when questioned what experiences they’ve had trying to survive on welfare, the response has been either to deflect to “get a job” or a complete lack of understanding. Being willfully ignorant means not doubting; not questioning; and enjoying support from fellow Cosy, Comfy Middle-class to maintain the illusion. That is the problem with the property-owning Cosy, Comfy Middle-class. Until a “market correction” strips away their over-inflated valuations, they are happy to live the mirage of “wealth”. Which leads to why we will likely see a fourth National term after Saturday. The Radio NZ poll-of-polls was fairly close, with only the Greens suffering a major drop in actual votes. Post 2014 election, National’s votes translated to 60 seats and was able to gain Supply & Confidence from “rats and mice” minor parties; ACT, Maori Party, and Peter Dunne. This time the National and red/green bloc are almost identical. Corin Dann: Let’s go back to 2005, in Rotorua, where you gave a pretty famous speech about your– You were being harried by media – probably like myself, because I was there – about who you were going to go with in 2005. And you stood up and said, ‘According to constitutional convention, the party which gains the most seats is the party which must first try and form a government. We will support this constitutional convention in the first instance.’ Can you give New Zealanders an assurance that that’s your position today and come September 24th? Winston Peters: All it means is what I said. ‘In the first instance’, that’s what you’d expect to happen, not just in this country but in every country. However, it’s only the first instance. It’s not a binding rule that says ‘In this first instance, this is clearly going to fail, therefore we should look elsewhere. That’s all it means. Both Labour and the Greens have resolutely ruled out any such referendum. Only one other major party has ever had a policy of doing away with those seats. It is common knowledge that there is considerable animosity between the Green Party and NZ First. 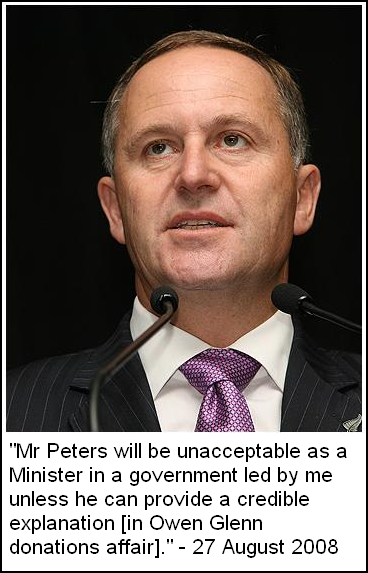 Peters is unlikely to sit in a three way coalition involving the Greens (or a four-way, involving the Maori Party). His preference would most likely be as one of two in a dual-party coalition. Of course, Peters could simply offer Supply & Confidence to “the largest party”. But what would be in it for him and NZ First? What gains could he achieve if he’s not “at the table”? In deciding whether to join in Coalition or simply offer Supply & Confidence to a fourth term National government, Peters would do well to remember that with the Nats at 45.1%, 54.9% of voters want change. That’s a clear majority. Choose wisely, Mr Peters. Choose wisely. This blogpost was first published on The Daily Blog on 22 September 2017. 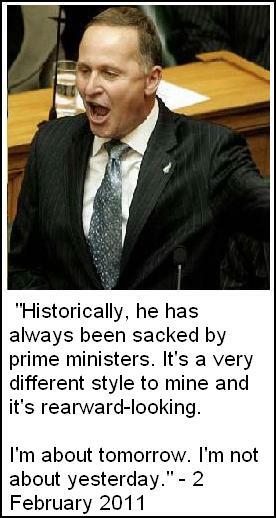 The jaw-dropping, gob-smacking, forehead-slapping gall of Winston Peters! For him to demand clarity and full disclosure from others – when he himself has made a fetish of not disclosing to voters who he will coalesce with, post-election – takes the Hypocrisy-of-the-Year Award from National and plants it firmly on his own Italian suited jacket-lapel. On top of which, none of Peters multi-billion dollar policies have yet to be costed. So here’s the deal, Winston. You want to see Labour’s tax plans? We want to see your coalition intentions. We’ll show you ours if you show us yours. After all, “One needs to know what we are talking about“. As Jacinda said, “Let’s do this“. On the matter of Labour referring taxation reform to a Working Group post-election, former-ACT Party leader Richard Prebble was scathing in his condemnation that Jacinda Ardern would not disclose her intentions toward implementation of a possible Capital Gains Tax. “…Jacinda thinks the answer to every problem is a new tax. Asking for a mandate for capital gains taxes without giving any details is outrageous. All new taxes start small and then grow. GST was never going to be more than 10 per cent. “In a “captain’s call” Jacinda changed the tax policy to say that a Labour victory was a mandate for Labour to introduce any new tax and at any rate that a nameless committee of “tax experts” recommended, just the family home is off limits. Any tax? What about land tax? Yes. Tax on the family bach and boat? Yes. Water? Petrol? Nothing is off the table. Will the capital gains tax be 33 per cent? Maybe. The petrol tax 10 cents a litre? Probably. Water tax. Guess a figure. “Trust us” says Jacinda. This, from the man who was a former Minister in the Lange Government which – in 1986 – introduced various neo-liberal “reforms” that the Labour Government had never campaigned on; had not included in their manifesto; and introduced the regressive Goods and Services Tax in 1986. The Goods and Services Tax was never disclosed to the public in 1984. Prebble and his cronies deceived the New Zealand public in the 1984 election campaign. They withheld their true agenda. They lied to us. For Prebble to now rear up on his hind legs, braying in indignation, pointing a stained finger at Jacinda Ardern, is hypocrisy beyond words. Richard Prebble should think carefully before raising his voice on this issue – lest his own track record is held up for New Zealanders to scrutinise. Does he really want that particular scab picked? The latest TV1/Colmar Brunton Poll (14 September) has Labour and the Greens climbing – a direct antithesis to the TV3/Reid Research Poll which had Labour and the Greens sliding (12 September). Are polling polling companies operating in the same country? Or Parallel Universes? Is it about time that all public polling was banned once early voting begins? The chasm in poll-results for National, Labour, and the Greens confirms critics of polls who dismiss results as wildly unpredictable. “Bugger the pollsters“, said Jim Bolger in 1993 – and with considerable justification. Though Winston Peters and his supporters may be nervous at the fact that both polls have NZ First at 6% – perilously close to the 5% threshold. Any lower and Peters’ Northland electorate becomes a crucial deciding factor whether NZ First returns to Parliament. Several commentators – notably from the Right – have been making mischief with the poll results, suggesting that a vote for the Green Party would be a wasted vote. Without the parachute of an electorate base, if the Greens fall below 5% in the Party Vote, their votes are discounted and Parliamentary seats re-allocated to Labour and National. John Armstrong and Matthew Hooton are two such commentators making this fallacious point. Fallacious because even at Reid Research’s disastrous 4.9%, the polling ignores the Expat Factor. Expats – predominantly overseas young voters – are not polled, but still cast their Special Votes, and often for the Green Party. It seems contradictory that there is a total black-out of polls on Election Day itself – when voting stations are open. But polling is allowed to proceed two weeks out from Election Day when voting stations are also open. It may be time for this country to consider banning all polling whilst voting stations are open. If poll results are so open to wild fluctuations, and certain commentators make mischief from questionable data, then the possible risk of undue influence on voters cannot be discounted. Once voting begins, polling should cease. The only poll that should count after voting begins is Election Day. On Radio NZ’s Morning Report (14 September), NZ First Leader, Winston Peters lost the plot. His haranguing of Guyon Espiner did him no credit. Peters’ blatant Trumpian-style lie flew in the face of his bottom-lines during this election campaign. Peters has issued several other bottom lines, including changing the Reserve Bank Act, banning foreign purchase of land, setting up a foreign ownership register, reducing net migration to 10,000 per year, and not raising the age of eligibility for New Zealand Superannuation (from 65). Peters also attacked Espiner for personally supporting the neo-liberal “revolution” in the 1980s. As Espiner pointed out, when Roger Douglas tore New Zealand’s social fabric apart, he was 13 years old at the time. Labour’s tax & spend – what ails the Nats? National has launched a full-scale attack on Labour’s taxation policies and plans to set up a Tax Working Group to investigate the possibility of a Capital Gains Tax. But there’s more to it than simply attacking Labour through a perceived weakness in their taxation policy. Labour is attempting to shift New Zealand away from a low-taxation/minimalist government, and return the country to the fully-funded social services we all once enjoyed. Remember free prescriptions? Yes indeed. Prior to 1986, prescribed medicine was free. National’s growing concern is not that Labour will introduce new (or higher) taxes. Their worry is that New Zealanders will like what their taxes can buy; free tertiary education. Lower medical costs. Cheaper housing. New, re-vitalised social services such as nurses in schools. Up until now, the Cult of Individualism had it’s allure. But it also has it’s nastier down-side. If New Zealanders get a taste for a Scandinavian-style of taxation and social services, that would be the death-knell for neo-liberalism. When Jacinda Ardern recently agreed with Jim Bolger that neo-liberalism had failed – the Right noticed. “New Zealand has been served well by interventionist governments. That actually it’s about making sure that your market serves your people – it’s a poor master but a good servant. – the Right became alarmed. This election is not simply between the National-led block vs the Labour-led bloc – this is the battle for the future of our country; the soul of our people. This moment is New Zealand’s cross-road. Did the country rise up in a clamour of righteous anger? Was there a vocal outcry on social media? Were the Letters-to-the-editor columns filled were disgust and demands for a fair go for beneficiaries? Like hell there was. If New Zealanders noticed, they showed little interest. $200 million in lawful entitlements withheld – and there is barely a whimper. A young solo-mum withholds information from social welfare in the mid-1990s, after then-Finance Minister Ruth Richard has cut welfare payments – and every conservative moralist; middle-class National/ACT supporter; media elite; and right-wing fruitcake, has a collective hysterical spasm of judgementalism that would put a Christian Fundamentalist to shame. Perhaps then, our sheep and pigs might finally learn to fly. This blogpost was first published on The Daily Blog on 15 September 2017. Ask David: When is a Bribe not a Bribe? National has added to it’s list of expensive election year bribes. Not content with offering $10.5 billion on new roads (which is additional to an estimated $12 billion to be spent on seven roads in National’s “Roads of National Significance” plan) – the Nats have promised to increase their HomeStart grant by $10,000. First home buyers would get $20,000 to buy an existing house or $30,000 for a newly constructed property. “ You’ve had nine years to come up with a policy like this and you leave it until the last 13 days in an election campaign to make such an announcement. This is a further sign of National Party desperation. If a government wants to do something, the money is there. If National says they’ll find the money, I’m sure they will, but the question is why has it taken so long? Treasury warned the Government in 2013 that increasing first home buyer subsidies would undermine the Reserve Bank’s efforts to slow down the housing market, force an early Official Cash Rate hike and push up house prices. “[Welcome Home Loan and KiwiSaver withdrawal schemes] may undermine the power and credibility of the Reserve Bank’s proposed use of restrictions on high Loan to Value Ratio mortgages, depending on up-take. Experience with homeowner grants in Australia suggests that such programmes tend to push prices up in a supply constrained environment by supporting greater demand, rather than improving affordability. “ It’s an admission of National’s failure to fix the fundamentals of our housing crisis. Instead of getting homes built, they’re trying to soothe home buyers’ pain with a bribe. The ACT Party says it would bring in bulk funding for teacher salaries, offering schools $93,000 per teacher but only if they abandon collective agreements. At its campaign launch this afternoon, ACT leader David Seymour said he wanted to give schools the power to decide what individual teachers earn. The party would do this by introducing bulk funding, where schools could opt out of the centralised payroll system and collective agreements. Party leader David Seymour said that the Government surplus of $3.7bn meant the party could promise to pay principals $975 million, to pay good teachers an extra $20,000 each, without cutting services or raising taxes. It is not just National that is showing increasing signs of desperation. When a right-wing political party that supposedly espouses individual freedom of choice offers tax-payer funded bribes for people to quit an organisation they have voluntarily opted to join – then we begin to understand that the entire neo-liberal paradigm is under threat. Will David Seymour offer our hard-earned tax money to other people to quit organisations he doesn’t agree with? Māori Party co-leader Marama Fox; Green Party leader James Shaw; ACT Party leader David Seymour; and United Future’s new leader, Damian Light participated in TVNZ’s Multi Party Debate on 8 September. Though why Peters believed that the two major parties – National or Labour – would participate in a Minor Parties Debate is unclear. Anyway, despite Peters’ toy-tossing tantrum, “minor” parties they may be, but their presence in Parliament will often determine the government, and influence policy. During the debate, the Resource Management Act was made the scapegoat by ACT leader, David Seymour, for the failing of the neo-liberal system to satisfy market demand for housing. Seymour ducked the challenge, changing the subject. There would be blue-blood in the streets of affluent, leafy, upper middle-class Epsom if high-rise developments suddenly filled the skyline. An example of what Epsomites might expect if ACT got it’s way and the RMA was abolished or significantly weakened to allow unfettered urban development can be found in the Wellington suburb of Mt Victoria. Amongst the single, two-story, and occassional three-story homes is a massive high-rise block of apartments called Melksham Tower. The building was constructed around 1975, prior to the passing of the Resource Management Act in 1991 (ironically by the then Bolger-led National Government). A newly completed block of high-rise flats in Mt. Victoria has become the focal point in a struggle between private developers and local residents. The local residents, led by the Mt. Victoria Progressive Association, are angry about the construction of Williams Development Holdings’ new 10-storey Melksham Towers building, which was originally given a council permit on the basis that it would be a block of flats. Residents have mounted a vigorous campaign against the tower block itself, but the main attack has been focused on the roots of the problem—the inability of a community to have any say in the development of their area. The campaign started from general meetings of the Progressive Association and a small group of people went from door-to-door in the area discussing Mt. Victoria’s development and the significance of Melksham Towers. The response was such that a demonstration of 70 residents gathered outside the tower block recently to show their disapproval of what has been described as ‘a human filing cabinet’. They also discussed what steps could be taken to prevent the construction of any similar structures. If David Seymour takes up James Shaw’s challenge, the good people of Epsom could “share the pleasure” of Mt Victoria’s citizens of learning the hard way what unfettered development has in store for them. Would Seymour accept that challenge? For Epsomites, ‘The protest will have only just begun’. English’s Committment on child poverty – real or “aspirational”? All we have to do is party-tick National and give him that fourth term in Parliament. Simple as, bro! Why didn’t National do this earlier in their nine years in office? Why have they put it off until now, when National is floundering in the polls? What has changed since October last year when then-Dear Leader, John Key, refused to measure and address child poverty because it was “a complicated area and there are many particular measures you can use”? How are they defining who those “100,000 children in poverty” really are? Will they be using dodgy stats such as Statistics NZ uses for unemployment? Thus far, National has steadfastly refused to measure child poverty in this country. Paula Bennett refused to accepted a recent UNICEF report on child poverty in New Zealand, disputing it’s figures. How will we know which figures are acceptable to National if it disputes the UN? “Aspirational” – National’s way of setting ambitious goals (especially at election time), and then shrugging when things don’t eventuate. I wonder if National’s campaign for re-election is also… “aspirational”? ACT considers Eugenic Final Solution for the Poor? The sub-text of Houlbrook’s assertion is clear and simple; poverty is the fault of the poor. Obviously they are incapable of enjoying the benefits of the neo-liberal, free-market system and have chosen to remain – poor. So after thirty-plus years of the “Revolution”, the peasants cannot recognise the paradise put before them by the likes of Roger Douglas, Ruth Richardson, et al. In which case, if ACT believes so deeply that “parents who cannot afford to have children should not be having them” – then it should be prepared to make that Party policy and legislate accordingly. I therefore call upon ACT Leader, David Seymour, to publicly announce that his party will be putting forward legislation to ban low-income families from having children. He can advise the public how much people must earn before the State will issue a permit to breed. Of course, that still leaves the thorny problem of what to do with children of parents who lose their job(s); become bankrupt; lose their business, and must rely on welfare. I look forward to how ACT will sell this policy to the public. This blogpost was first published on The Daily Blog on 11 September 2017.
Who paid for the Budget surplus? The 2017 Pre-Election Fiscal Update (PREFU) revealed that the Nats had achieved a respectable $3.7 billion surplus – contrasting sharply with the $1.6 billion forecasted surplus in the May 2017 Budget. How did National achieve such a remarkable feat, despite reduced revenue from tax cuts in 2009 and 2010 and the re-build after the Christchurch and Kaikoura earthquakes?. New Zealand’s health budget has been declining for almost a decade and could signal health reforms akin to the sweeping changes of the 1990s, new research claims. Six prominent industry health leaders and researchers contributed to the editorial in the latest edition of the New Zealand Medical Journal, after several months analysing Government documents and data. Their analysis showed Government spending in health had steadily tracked downward since 2009, despite constant reassurances from health ministers that spending was increasing year-on-year. The $16.1 billion 2016 Health Budget, announced on Thursday, was $170 million more than last year, including $124m for Pharmac, $96m for elective surgery and $39m for a new bowel screening programme. However, the researchers’ analysis of Budget data from 2009-10 found the country’s health budget had fallen short of what was needed each year to cover new services, increasing costs and the Ministry of Health’s cost-weighted index, which accounted for population growth and ageing. The accumulated “very conservative” shortfall over the five years to 2014-15 was estimated at $800 million, but could be double that, Canterbury Charity Hospital founder and editorial co-author Phil Bagshaw said. Vote Health’s operational expenditure decreased from 6.32 per cent to 5.95 per cent as a proportion of GDP in the same five years. Government expenditure was set to continue falling overall, with New Zealand ranked 26th out of OECD countries for spending as a proportion of GDP in 2013. This meant further cuts for health spending, which was estimated to drop by about 4 per cent a year. “The continued under-resourcing of our health services . . . is not owing to unaffordability; it is a policy decision to reduce government expenditure overall and introduce tax cuts,” the editorial said. Then again, those like Bill English – who stands to gain the most from tax cuts – are also the most likely to be able to afford private health insurance. Steven Joyce – Pot. Kettle. Hypocrite. “Government annual operating expenditure in these forecasts increases from $77 billion to $90 billion over the next four years, which is sufficient for significant ongoing improvement in the provision of public services,” Mr Joyce says. And interestingly, during National’s massive borrowing-spree, interest rates have remained low. Joyce’s contention that borrowing leads to higher interest rates for mortgage holders doesn’t seem to have happened (yet) – and National has borrowed like there’s no tomorrow. By making up outright lies about Labour’s budgetary plans, Joyce has not only revealed himself as as deceptive – but drawn unwanted attention to National’s own irresponsible borrowing over the last nine years. If it hasn’t been said already, the seat of Ohariu has become irrelevant. Whether Brett Hudson or Greg O’Connor wins is now academic. Once again, it is the Party Vote that counts. When Dunne was standing, the coat-tailing provision made him a valuable asset to National. If Dunne breached the 1.2% threshold as well as winning Ohariu, he would’ve dragged in another MP off the United Future party list. It is the same reason National offered patronage to David “H” Seymour to gift him Epsom: the possibility of an extra ACT MP via MMP’s coat-tailing rule. This is why Judith Collins doubled-down and stubbornly refused to implement the Electoral Commission’s recommendations in 2013 to eliminate the coat-tailing provision. The Green Party was thus correct to stand a candidate in Ohariu. Whilst the Greens are not seeking to win the electorate, they are chasing Party Votes – and Ohariu is another opportunity to remind voters that the Greens are vital for this country’s environmental well-being. Simply put; to be healthy we need our Greens. Bill English’s announcement on 4 September on TV3’s Leader’s Debate that his party would raise 100,000 children out of poverty in the next three years appears to have been policy made-on-the-hoof. National have pledged 600,000 low-income New Zealanders will have access to $18 GP visits. National will also expand the community services card to an additional 350,000 people, with low incomes and high housing costs. Alongside free GP visits for under 13s and the Very Low Cost Access (VLCA) scheme for GP visits, which were already in place, National’s new policy would mean more than half of New Zealanders would be eligible for either free or cheap doctors visits. The obvious question is: has Steven Joyce checked if it’s all been costed? Are there any lurking micro-Black Holes in National’s Budget? Wouldn’t it be ironic if…? This blogpost was first published on The Daily Blog on 6 September 2017. Parliament’s Grassy knoll: who tried to character-assassinate Winston? The leaking of Winston Peter’s superannuation over-payment is well known. Also known is that Ministers Paula Bennett and Anne Tolley were briefed by Ministry of Social Development and State Services Commission, respectively, on Peters’ private details regarding the over-payment before it was leaked to the media and made public knowledge. Also briefed – though it is unclear why, as he was not a warranted Minister of the Crown – was political appointee, Chief of Staff, Wayne Eagleson. Evidently the only person in the entire country not briefed was the Prime Minister, Bill “Double Dipper from Dipton” English. Bennett, Tolley, and Judith Collins have all denied any involvement in the leak. Which is true, in a Bizarro World kind of way. In 2009, when Bennett mis-used her Ministerial powers to reveal personal details of two solo mothers on the DPB, it was done in a very public manner. Asked if she would do the same thing again, Bennett said “it would depend on the circumstances”. Perhaps Judith Collins, who disclosed a State servant’s name and personal information to a right-wing blogger, was involved in the leaking of Peters’ situation? Prime Minister John Key has conceded it was “unwise” for Judith Collins to give Cameron Slater a public servant’s name, job title and phone number which was then used in an attack post on his Whale Oil blog. However, John Key says no disciplinary action will be taken against the Justice Minister because the action pre-dated the final warning he gave Ms Collins over the Oravida scandal. Mr Key says he still stands by the Justice Minister. “I think the passing of private information, in terms of phone numbers, I think that’s unwise. It’s unwise of a Minister. Look in the end it’s one of those things,” Mr Key says. “I absolutely and strongly deny this and any suggestion of inappropriate behaviour. I am restrained in clearing my name while I am still a Minister inside Cabinet and I believe the right thing to do is to resign as a Minister so I am able to clear my name. Only Minister Tolley has not been accused of a direct privacy violation of any individual(s) – at the moment. 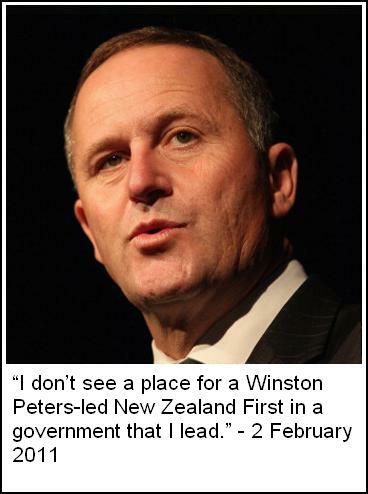 However, MSD is know to leak like a sieve and it was MSD that briefed the Minister regarding Winston Peters. One thing is for certain; some Ministers are not averse when it comes to leaking personal details of individuals who run foul of this government. Recent revelations that blogger and activist, Martyn Bradbury, has had his private bank details scrutinised by Police shows how little National and its state agencies respect the privacy of individuals. Especially those who dare criticise the current regime. Carlson is seventh on the list and would enter parliament if ACT gained 5 per cent of the party vote. Parliament needed people with life skills and her life experiences would help stand her in good stead if she is elected, she said. The former West Auckland police officer owned her own business in New Plymouth, is a North Taranaki SPCA board member, and ran fitness programmes for cancer support groups. She is also completing a business studies degree extra-murally at Massey University. “I’m fairly young, and I’m surprised to be high on the list because I’m a bit of political newbie, but I’ve already seen lot of things from working in the police. 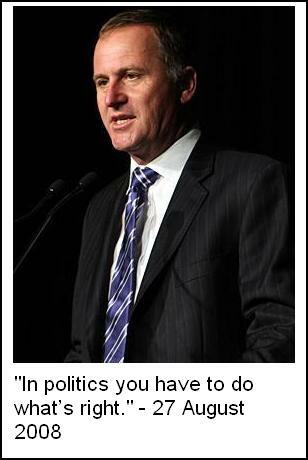 All well and good – engaging young New Zealanders to enter politics should be encouraged. It should never be the sole “happy hunting grounds” for Baby Boomers seeking to feather their own nests, at the expense of younger generations. It should be no surprise to anyone that Ms Carlson wonders why ACT is not supported more at the ballot box. It’s not because “people don’t know more about ACT“. Quite the contrary – most New Zealanders middle-aged and over – are very clear about ACT and what it stands for. After all, we lived through ACT-style so-called “reforms” in the late 1980s and into the 1990s. That is why ACT is not well supported except by a tiny minority of unreconstructed wealthy, privileged extremists. (Aka, the One Percent.) At 28, Ms Carlson would be oblivious to all this. At least Ms Carlson has a measure of self-awareness. Given time and experience she may understand how that privileged upbringing gives her a head start in life that is denied many others. She may even experience that critical Road-To-Damascus revelation that ACT’s market-driven ideology has made matters much, much worse since 1984. I suggest the next cuppa tea she has is not with David Seymour, but Jim Bolger. Jacinda Ardern has a 6% lead over Bill English as preferred Prime Minister among definite voters. Among the 860 adult respondents who are both registered to vote and 100% likely to vote, Ardern leads English by 43% to 37%. Among all of the 960 respondents to the August 11-15 Horizon Research poll Ardern leads 45% to 32%. Winston Peters is preferred Prime Minister by 15% of all respondents and 14% of definite voters. James Shaw, the Green Party leader, is preferred by 2%, and David Seymour of ACT and Te Ururoa Flavell of the Maori Party each by 1%. Coincidentally, English’s current popularity at 37% is similar to Key’s Preferred Prime Minister ratings before he stepped down as Dear Leader Prime Minister. By May last year, Key’s PPM rating had fallen to 36.7% – continuing a steady downward trend. Which means Ms Ardern is now more popular than John Key was, prior to his resignation. Queensland’s Premier, Annastacia Palaszczuk, has announced a major step back from neo-liberalism’s prime enabler, globalism, by announcing that the State government would prioritise local businesses for contracts. The aim is to create more local jobs. “ Our new procurement strategy is unashamedly a ‘Buy Queensland’ one. No longer will we be constrained by free trade agreements that have seen jobs go off-shore or interstate. Wherever possible, one regional and one Queensland supplier will be invited to quote or tender for every procurement opportunity offered. Preference must be given to local subbies and manufacturers on significant infrastructure projects of $100 million or more. According to the SBS report, Queensland spent A$14 billion per annum on supplies, services, plus A$4 billion building and maintaining State infrastructure. Ms Palaszczuk made a valid case for buying-local when she pointed out “this money comes from Queensland taxpayers, it is only right we spent it in a way that benefits Queensland businesses and workers“. The prime role of a government in a Western-style democracy has always been (or should be!) to protect and enhance it’s citizens. Creating an environment where local jobs flourish is part and parcel of that dictum. Governments are not “in business” to create jobs in other countries at the expense of their own workers. “ The ‘Buy Queensland’ promotion should be about encouraging Aussies to buy their local product, just like ‘Buy NZ Made’ encourages New Zealanders to buy Kiwi-made. It’s OK to encourage your people to buy local, but it’s not OK to mandate State Government weightings that amount to protectionism. In plain english, Ms Beard is fine with “it’s OK to encourage your people to buy local,” but “it’s not OK to mandate State Government weightings that amount to protectionism” because it harmed the interests of her members. Tough. It’s about time globalisation began to be rolled back instead of continually exporting jobs and entire businesses to off-shore jurisdictions where labour is cheaper and easily exploitable because of lax (or unenforced) labour laws. We need fair trade, not so-called “free” trade. “Free” trade is not free when we, the tax-payers, have to foot the bill to pay for welfare, because workers became unemployed after their jobs were exported to China, Vietnam, Pakistan, Fiji, etc, or cheaper (and often shoddier) goods imported to unfairly compete with locally-made products. Queensland’s Premier understands this. She wants jobs created for her own workers – not in some other country. Especially when those workers in other nations won’t be paying tax in Queensland. This blogpost was first published on The Daily Blog on 4 September 2017. National’s Running Ad – Unintended Messaging? Nearly everyone has seen National’s “running ad” – a variation on last election’s rowing-boat advertisement – but without the plagiarised and illegal use of an artist’s music. The full advert can be seen here, on Youtube. The messaging is fairly uncomplicated and straight-forward; the blue (actually, more like teal) team is a metaphor for National running together as a team, whilst other “joggers” – representing Labour, Greens, and NZ First – are limping along. It’s about as subtle as burning a cross on a Black American’s front lawn. Yup. New Zealand as we imagine it in our fantasies. Is this really National’s vision of an unspoiled, 100% “Pure” countryside – with a dam across it? So the “message” from this advert is that National will readily ignore other people in obvious distress and carry on their merry way? The subliminal theme presented by the Teal Team is one of callous indifference. This may not have been National’s intended message. But it sure ties in with child poverty, homelessness, income inequality, and other dire social problems ignored by National. Not until the media spotlight is focused sharply on the plight of families living in garages, cars, or tents, does National react. The focus groups presented with this advert clearly didn’t understand the subconscious meaning within these images when they gave it their ‘thumbs up’. Or maybe they did – but just didn’t care. As at 1 September, the National Party runners ad scored 570 ‘Dislikes’ as opposed to 173 ‘Likes’. On Youtube at least, the Nats have already lost the election. The doom of Metiria Turei was well and truly sealed when the Establishment Media (aka, Media Elite) and assorted right-wing bloggers and commentators ripped her reputation to shreds like a pack of blood-crazed pit-bulls in a feeding-frenzy. Some of the public understood her situation. Many did not. The conservative public passed judgement on Ms Turei because, well, passing judgement on someone elses’ perceived moral ‘lapses’ makes the Judger feel so much better about him/herself. Former Greens co-leader Metiria Turei has received the most nominations for the 2018 New Zealander of the Year Awards so far. Support for Turei increased after her resignation following her admission she’d lied to Work and Income to receive higher benefit payments in the 1990s, the awards organisation said. The nominee with the second highest number of nominations is the Australian deputy prime minister, Barnaby Joyce – although his eligibility to win won’t be assessed until nominations have closed. Joyce was recently revealed to be a New Zealand citizen because his father was born here. The revelation came during a spate of Australian senators having to step down after checking laws preventing them holding dual citizenship while in office. Since then, Joyce has renounced is New Zealand citizenship. Stuff has contacted Joyce’s office for comment. The Dompost focused more on Australian deputy prime minister, Barnaby Joyce, than on Ms Turei’s public support. Despite Turei’s fall from grace after she publicly admitted she lied to Winz about her living circumstances in the 1990s she has received the most nominations. In an act of casual minimisation, both papers made sure their stories did not reflect any degree of public support for the former Green Party co-leader. One thing seems clear – there is an under-current of support for Metiria Turei. Anyone wanting to add their voice to nominate Ms Turei can do so on the New Zealander of the Year website. Following on from several political parties expressing varying degrees of a gradual move back to state-funded tertiary education, Fran O’Sullivan – the doyen of the Right and nominally an “impartial” journalist writing for the NZ Herald appeared on TVNZ’s Q+A on 27 August as one of it’s regular panellists. “… when he [Phil Twyford] talked about property speculators, what and how […] what exactly are you going to do there? Are you going to bring in place capital gains taxes? Because I say that because right now, including our government officials, we’re being marketed internationally as a hot place for property investment. No capital gains tax. No stamp duty. “Well I was actually quite stunned that people are talking in the range of $500,000 to $600,000. For first home owners I think that’s quite ridiculous. I think it needs to come down further. A pro-National, ostensibly pro-free market commentator loudly voicing support for seizure of privately held land? Make no mistake, this is heresy against the supreme core neo-liberal tenet of the supremacy of individual land-owning “rights”. What Ms O’Sullivan was advocating is a giant leap to the Left. In effect, private land ownership has not only failed to deliver affordable homes to young New Zealanders – but is actually an impediment. Our aspirations for families to own their own homes has been confounded by unfettered capitalistic greed. Ms O’Sullivan appears to have experienced a Road-To-Damascus conversion that neo-liberalism is not the answer. Like any inflexible, dogmatic ideology, it is part of the problem. “The preliminary work indicates the environmental effects are small, but after 100 launches we may want to have a fresh look as to what is the future regulatory regime beyond that. By the time we have had 100 lots of debris hit the ocean, fall to the seabed, we will have a better idea [of the environmental impact]. Right now we are not able to get advice on exactly how much of the jettisoned material will actually make it to sea level, or whether it will burn up prior to hitting the ocean. Meanwhile, National has permitted granting of a consent to Trans-Tasman Resources to mine 50 million tonnes of iron ore sand off the coast of south Taranaki each year, every year, for the next 35 years. The damage to ocean life in the surrounding sea and ocean floor cannot even be imagined. The zone of mining would most likely become a dead-zone – uninhabitable. Unbelievably, consent was given by the so-called Environmental Protection Agency, despite receiving 13,417 submissions demanding that Trans-Tasman Resources’ application to be declined – and only 147 submissions in support. One has to wonder where Nick Smith’s priorities lie? At the bottom of the ocean floor, by the looks of things. This blogpost was first published on The Daily Blog on 3 September 2017.